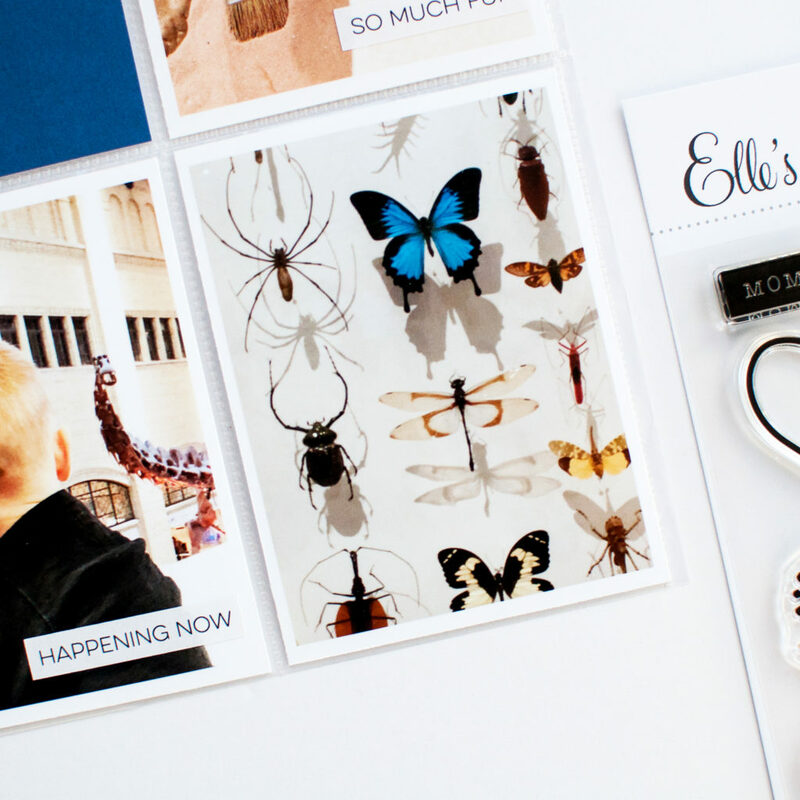 I am so delighted to be returning to Elle’s Studio Creative Team for another year!! I am so proud of the work that I did for her in 2018 and I just adore her modern and playful products. 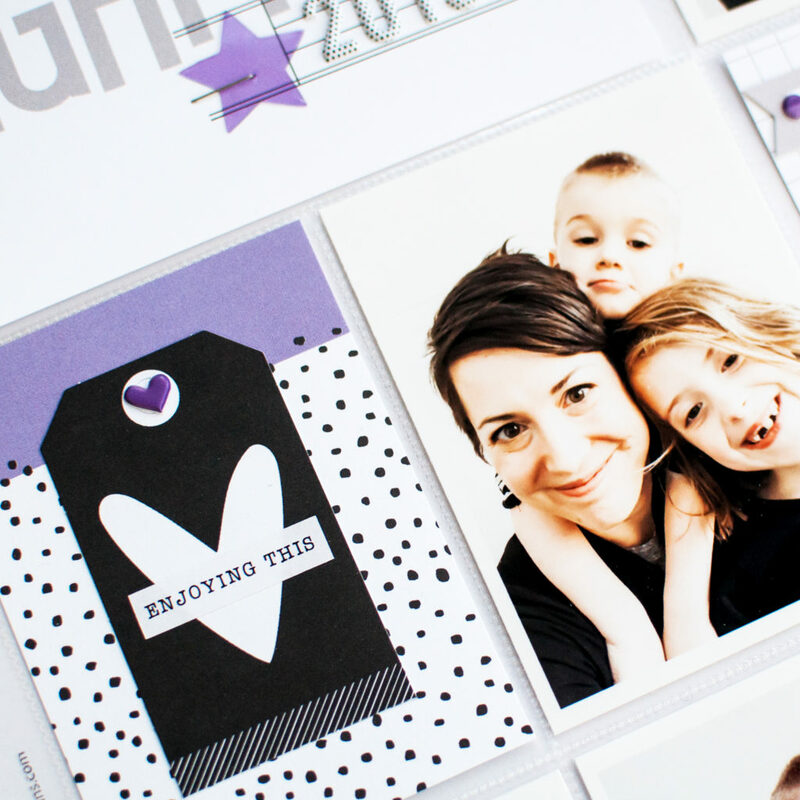 This year, like last year, I will be documenting my family memories in 9×12 monthly format. 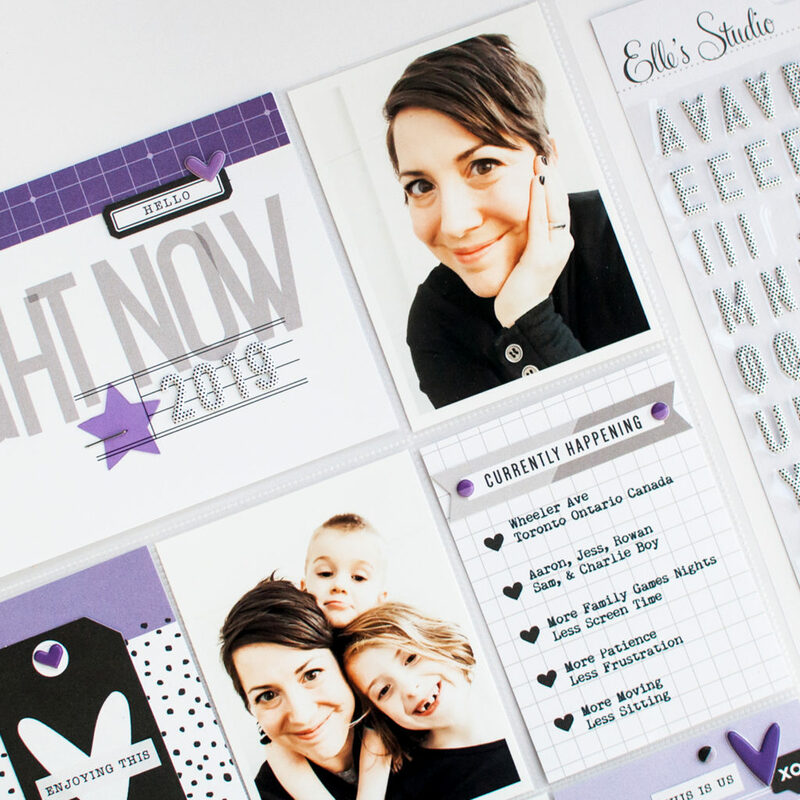 Here is a look at my 2019 Project Life Title Page. 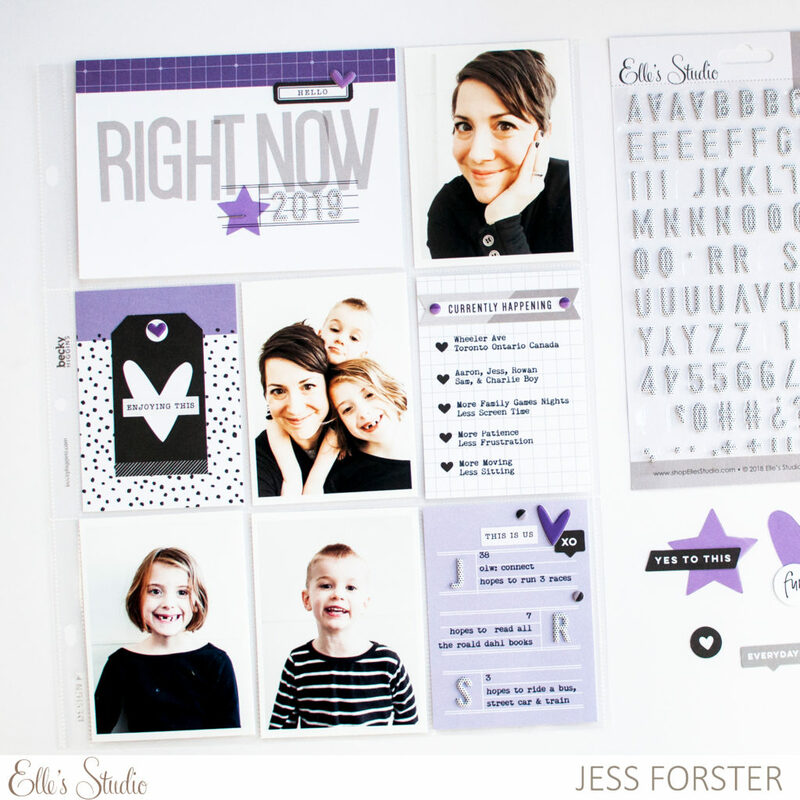 To me, what really stood out in the January Elle’s Studio monthly kit, were the black, white and purple journaling cards as well the add on So Loved Shipping tags and Heart and Star acetate die cuts. Swoooooonnn! 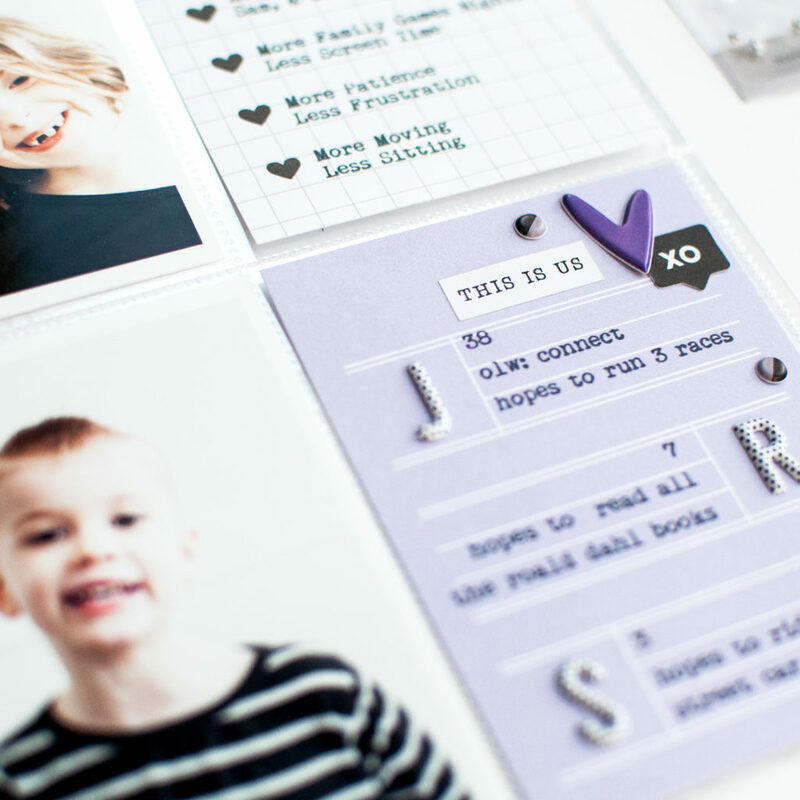 Like in all my Project Life title pages for the past number of year, I took shots of my kids with the DSLR. I included the best photos of each of the kids as well as group shot with just the three of us. I also included a selfie of me, as well as wrote down our family motto, our ages and our hopes for the year. 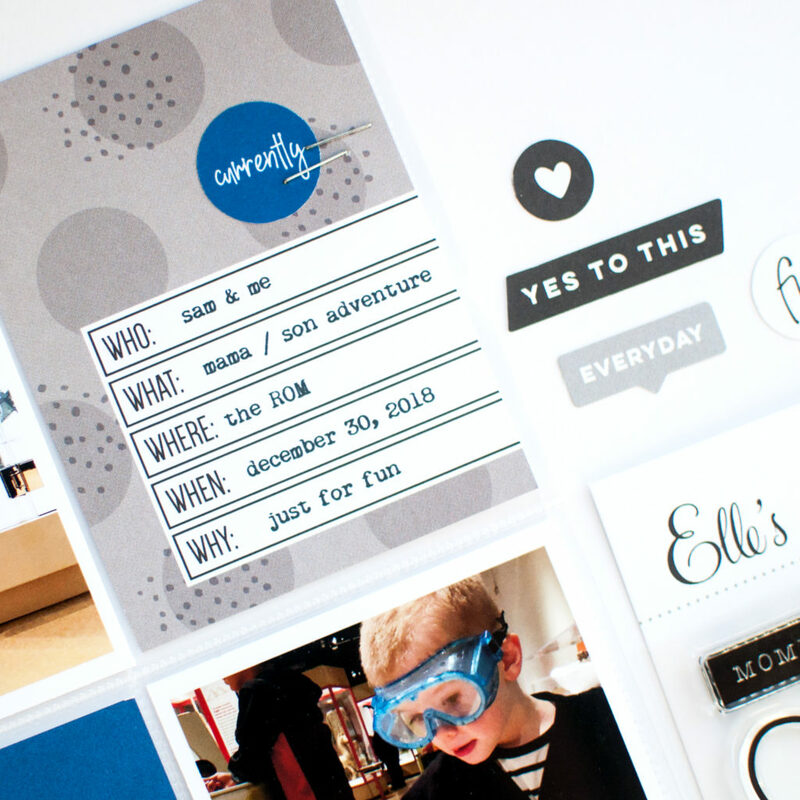 I used the Black and White polka dot puffy stickers to highlight the person’s thoughts. Unfortunately my husband had to work when I took these photos. Although he is not in the pictures, he did help me come up with some of the journaling on the page. Progress over perfection! This year, my one little word is connect. Recording our adventures / how we connect this year as a family, is also important to me. 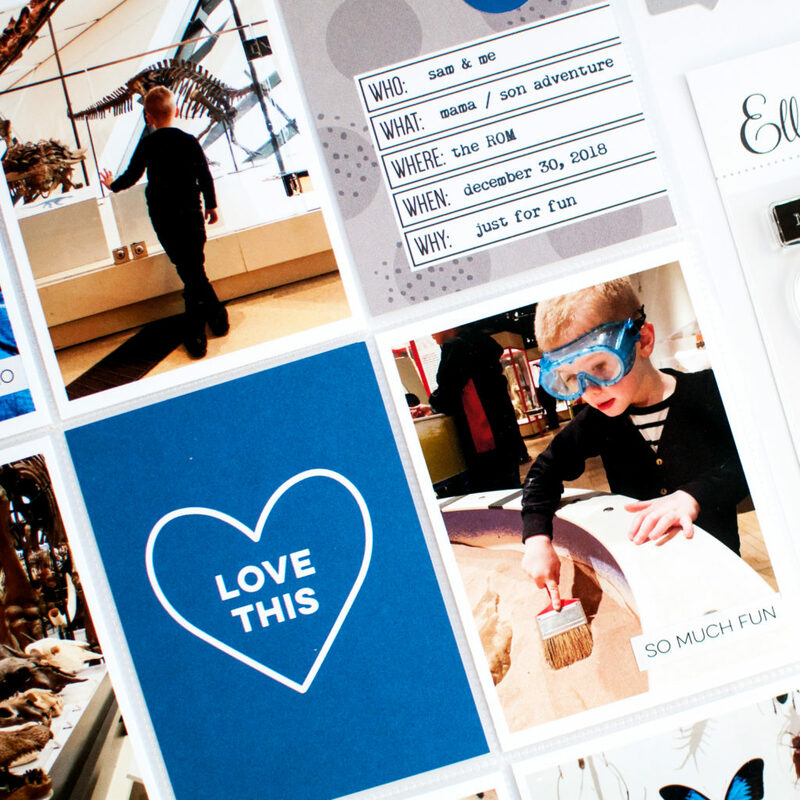 Here is a layout I created about our recent trip to the Royal Ontario Museum aka the ROM. Living in the city of Toronto, we are so lucky to have so many amazing museums to visit, right in our own backyard. Although Sam, my son, was a bit nervous of the dinosaur bones, he still enjoyed the our afternoon. Looky-looky! I did a little stamping on the bottom left hand journaling card using the Happy Heart Stamp. I was a fan of the simple phases on the Happiness Found stickers and simply added them to my photos to create visual interest. This visit was so much fun! 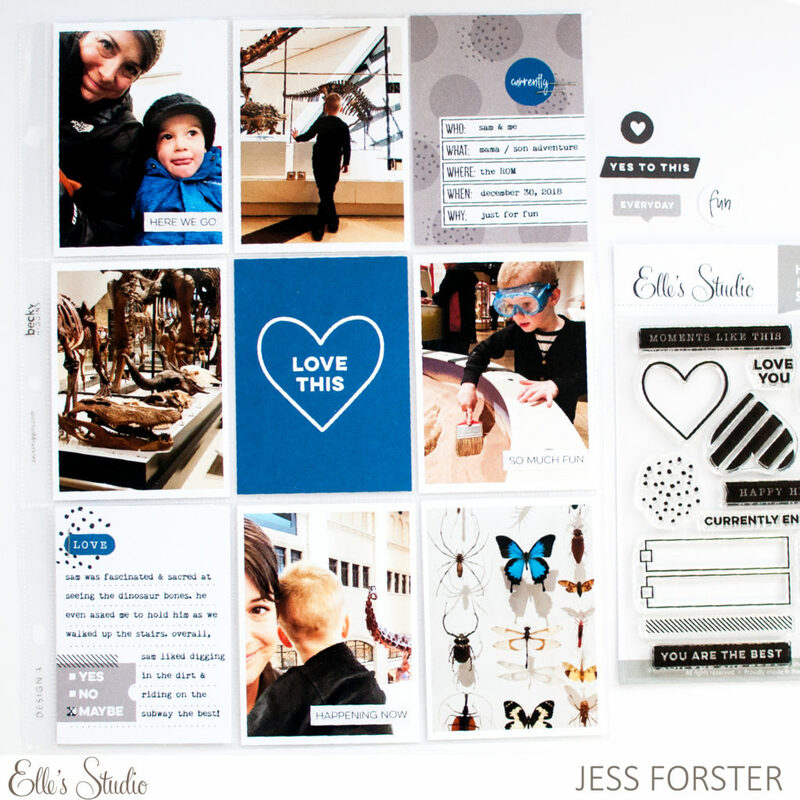 I loved documenting this in a 9×12 format and including so many photos with the blue, white and grey products from Elle’s Studio! All new goodies are on sale now! I live in Burlington, ON and I love your work! I am headed to Story Camp in March and wonder if you have any tips for me as I prepare to go, places I should see etc??? I travel on Wednesday and home on Monday. Grateful for any tips and wisdom! I still can’t believe I get to go!!!! I am super excited. Thanks in advance for sharing your thoughts and wisdom!